You are here: Home / Education / The Gray Whale’s Eye – What do We See? 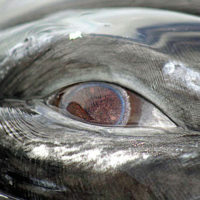 What do we see when we look into the eye of a whale? Some say that “the eyes are the windows to the soul”, evoking emotion and wonder. Others say that animals look for man’s intentions by looking into his eyes. 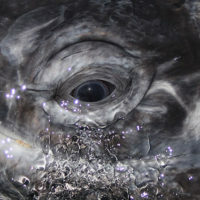 Is this true for the gray whales of Laguna San Ignacio? Gray whales see moderately well both in air and water, but their visual system is likely inferior to their auditory system because of functional restrictions in turbid water and darkness. Their eyes are flattened on the front to compensate for the refraction of light in water, making them near-sighted out of the water. The rods and cones in their eyes are adapted for heightened sensitivity to dim light and for improving contrast and resolution underwater. The position of the eyes suggests that they have stereoscopic vision forward and downward permitting estimation of distance while swimming and searching for food on the ocean floor.